Tucked between the Kanchenjunga Conservation Area and Makalu-Barun National Park, this corner of Nepal is so isolated from the rest of the country that you have to walk two days to reach the nearest village. Olanchungola is three days away over the Lumba Sumba pass in Taplejung, a route so hazardous that few locals venture across it. But now that pass is part of the Great Himalayan Trail acrossNepal and there is potential for locals to benefit from trekkers. We are in the remotest corner of a roadless part of Sankhuwasabha which has remained much like Nepal was before trekking and tourism came. There are no health posts, no schools, no telephone towers, there is little here to suggest the presence of the Nepali state except a poster urging the conservation of red pandas. 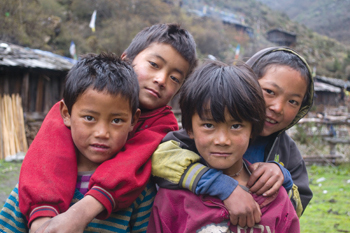 Since he doesn’t go to school and hasn’t had much contact with outsiders, Phurpu can’t speak Nepali properly. His friends Sonam Lopsang, Pemba, Lhakpa, and their siblings spend their days herding yaks. As the boys get older, they will take the animals to meadows above 4,500m in the monsoon. Once they turn 18, they will get married, after which life will be a battle between growing needs and scant resources. Even with healthy monsoons, at this altitude very little farming is possible. 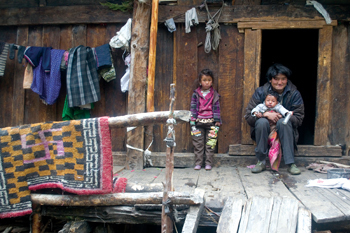 The 20 households here get most of their food and necessities from Tibet in exchange for timber and medicinal herbs. A wood plank two metres long fetches Rs 100 across the border and because the moist cloud forests are rich in pine and fir trees timber trading provides a good income and has sustained families for generations. But as the villagers get more desperate and Tibet becomes more affluent, the slopes around Thudam are being unsustainably logged. Without trees to hold the top soil, the mountains are scarred by landslides. The banks of the nearby Modek Chheju River are littered with packets of Chinese noodles and candy wrappers. Selling yak milk, ghee, and chhurpi to villagers downstream brings in Nepali currency, a rare commodity in this part of the country. Having little contact with ‘mainland’ Nepal means Thudam residents feel closer to Tibet than Nepal and questions about politics in Kathmandu draw blank stares. With its lush forests, stunning scenery, and an intact culture, Thudam has tourism potential. But its remoteness and lack of facilities mean few venture here. “If we had more trekkers, we could open ourselves to the outside world and maybe that would help improve our living standards,” admits 50-year-old Tenzing Bhote, but there seems to be no interest in the district or national capital. For now, Thudam is protected by its own isolation. But unless the villagers here have an alternative source of income, they will have squandered away the forests that would make it attractive for visitors. Its hard defending democracy when those who want polls arent nearly as fired up as those who dont. A rehabilitation centre in Jorpati has just completed its first year of helping people with spinal injuries, and has shown how much more needs to be done. Why not enshrine the right to rebel against an odious order as a basic human right? There are scary and depressing lessons for anyone who supports restricting access to information.